Georgia may be lashing out at Delta, but they aren't breaking up any time soon. 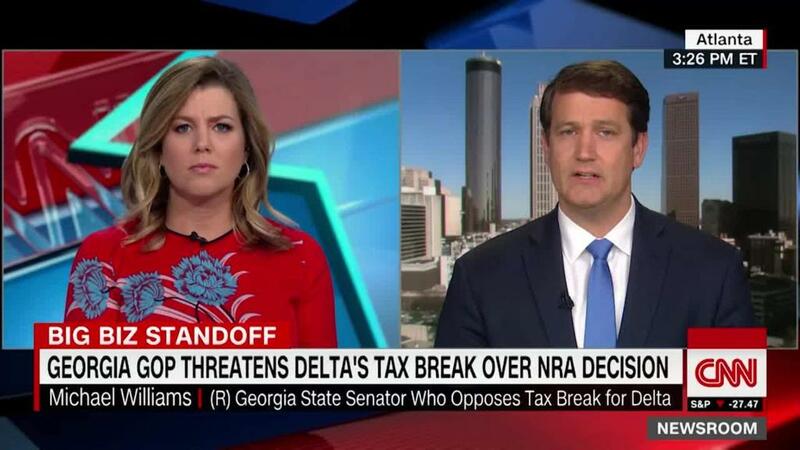 This week, Georgia lawmakers removed a jet fuel tax break worth about $50 million from a bill after the airline distanced itself from the NRA. The state Senate passed that version of the bill on Thursday, and Governor Nathan Deal plans to sign it into law. The scuffle prompted other states to court Delta (DAL). New York Governor Andrew Cuomo also invited the airline "to find a new home in the Empire State." But don't expect Delta (DAL) to go anywhere. "Delta and Georgia need each other," said Seth Kaplan, managing partner of Airline Weekly and co-author of "Glory Lost and Found," a book that chronicles the airline's revival in recent years. For one thing, Atlanta is Delta's largest hub by far. It's three times the size of either of its next two busiest hubs, Minneapolis and Detroit, Kaplan said, citing research from the aviation data firm DIIO. That's not the case for other airlines, where the differences between the top few busiest hubs are much smaller. Plus, Atlanta's airport is well-designed and cheap for airlines, Kaplan explained. "On the Monopoly board, Atlanta is Boardwalk," he said. "And Delta has it." Delta could conceivably move its corporate headquarters out of Atlanta. But that's also unlikely -— it would be costly to separate the company's executives from its hub airport. And Georgia is eager to keep the airline. The Atlanta airport, Hartsfield-Jackson, is the busiest in the world and connects the city and state to the global economy. "Atlanta is what it is because of that airline hub," Kaplan said. Before the Senate killed the tax break this week, Deal said the exemption would help "keep Georgia competitive as a major international hub of commerce." The state started offering a tax break on jet fuel in the wake of the recession, when Delta was struggling financially. It stopped offering the cut in 2015, and was on track to bring it back this year as part of a larger tax overhaul. Things took a turn this weekend, when Delta ended a discount for NRA members flying to their annual meeting. In response, Georgia Republicans took the company to task for targeting the powerful gun lobby. Delta was one of roughly a dozen companies that cut ties with the NRA after 17 students and staff were shot to death at a high school in Florida. It has yet to respond publicly to the lawmakers. There's a good chance Delta will get its tax break, anyway. On Wednesday, Deal promised to find "a pathway forward for the elimination of sales tax on jet fuel, which is nonnegotiable." Even if Delta doesn't get the tax benefit, it won't make much of a difference to its bottom line. The tax break may have been welcome several years ago, but $50 million is still a drop in the bucket for a company of Delta's size. Delta reported $41.2 billion in revenue last year and profit of $3.6 billion.